David Wilson has the physical tools of a Pro Bowl RB, but the decision-making and patience of a college player. There's reason for optimism with this pro prospect, but find out his specific deficiencies as a runner based on film study. Photo by Michael Miller. As I explained yesterday, Vision is often poorly defined as an abstract, catchall intangible that is vital to the success of a ball carrier. Vision should be something we actively try to define and despite its intuitive characteristics I believe there are major components of the skill set that running backs learn as late as years into their pro careers. Reggie Bush, C.J. Spiller, LeSean McCoy, and Jamaal Charles are recent backs that had to improve some aspect of their vision to complete that transition from promising prospect to effective performer. After studying two games and over 50 touches from the 2011 season, I believe Wilson is one of those players that my evaluation checklist will deliver a lower grade than the analysis seen in my evaluation profile. What I love about the RSP evaluation process is that when this happens, I generally know that I have a player with immense upside but clear deficiencies that might take time for him to address. Wilson fits that description as well as any back I’ve watched in a decade. His 24-carry, 82-yard performance in the Sugar Bowl versus Michigan, included runs of 11, 11, 12, and 22 yards. It also included carries he could have made better decisions to avoid outputs of zero, zero, 1, 2, 3, -3, -4, and -22 yards. This is the most positive thing you’re going to see and hear about Wilson in this post, because today is dedicated to weaknesses with Wilson’s vision as a runner. Wilson lost 22 yards on a 1st and goal with 9:44 in the first quarter. Unless the word fumble is injected into the equation, there is no reason a running back should ever lose this many yards in the red zone. Let’s examine the play and the decisions Wilson made that cost his team field position. The play began with a 22 personnel I formation set with an unbalanced line versus a five-man Michigan defensive front with another four in the box. The run play was power with Wilson taking the exchange towards RT. 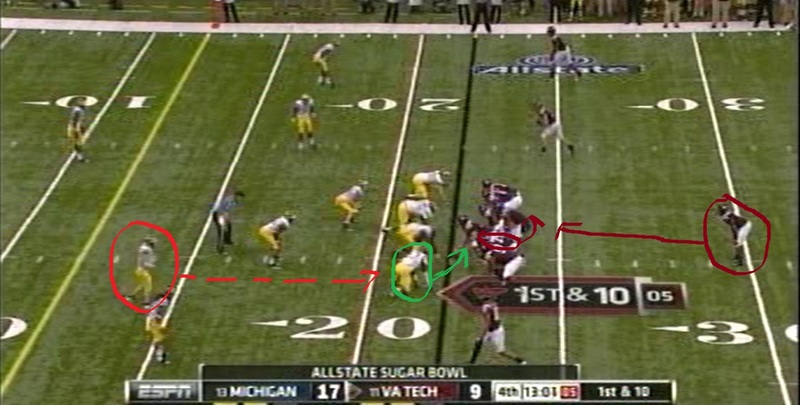 However, the defense penetrated the line from end and inside the RT just as Wilson passed the blocker to the outside. 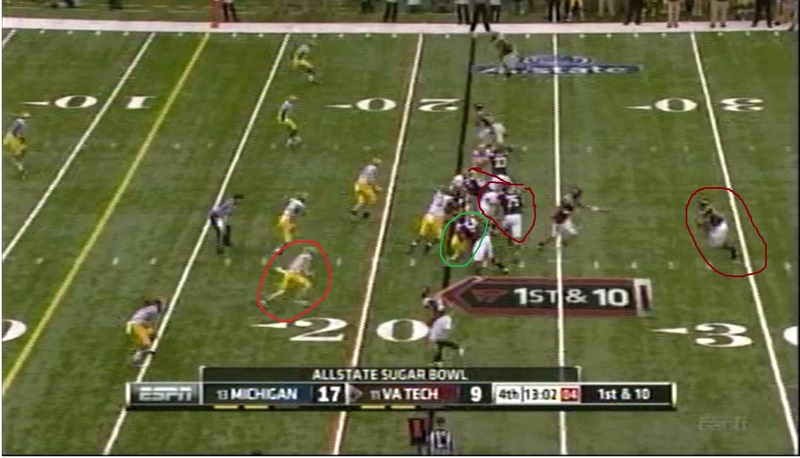 This penetration forced Wilson to veer away from the line of scrimmage as he stretched the run towards the sideline. This was Wilson’s first mistake. On first and goal, if the outside is there right away, square the pads and get what you can downhill – even if it’s a small loss. However Wilson is like most backs with top-notch athleticism. He believes in his speed and acceleration. He believes he’s the best athlete on the field. In fact, he’s probably correct to believe in this. What he doesn’t understand is that athleticism is only a tool in a running back’s arsenal. The solder might give that quick burn, but sometimes a well placed shot of the hammer is what’s needed. 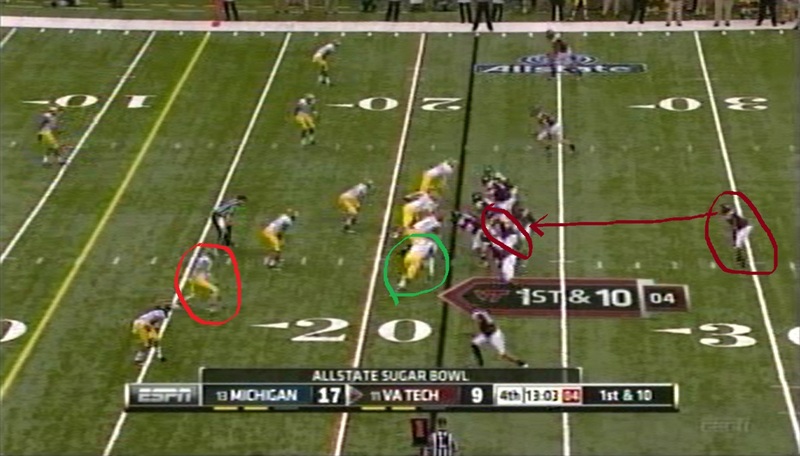 Wilson’s second mistake came when he discovered the Michigan line had the entire sideline hemmed in and he was still trying to burn them with his speed. Instead of turning down hill and finishing the play, Wilson reversed his field. This move placed him seven yards behind the line of scrimmage and in the process he slipped to the ground. 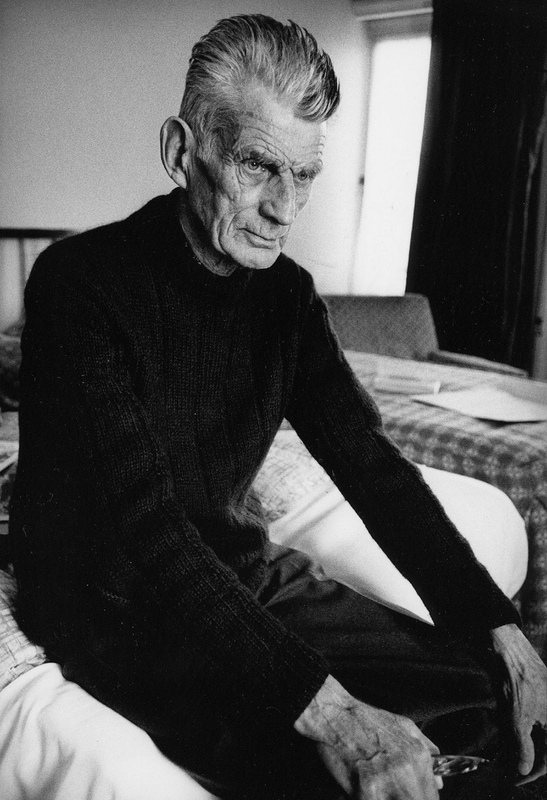 Playwright Samuel Beckett was a mastern of the modern tragicomedy in literature. 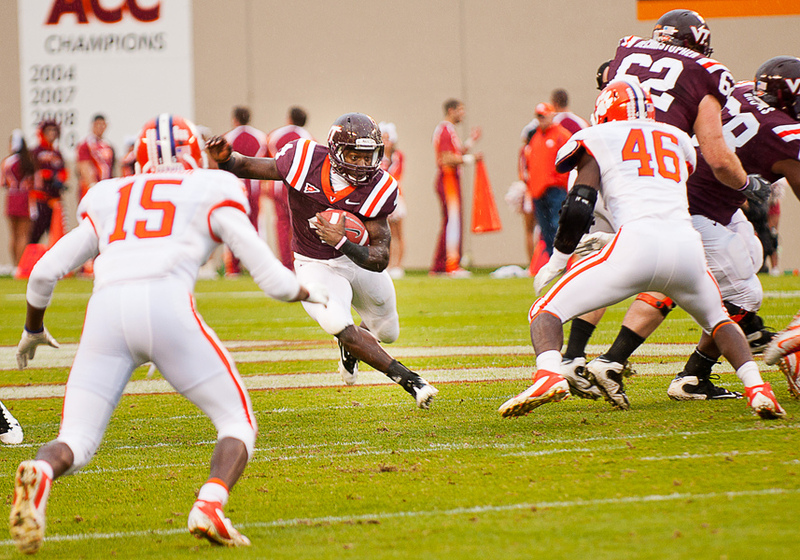 Va.Tech RB David Wilson mastered his own tragicomedic moment in this year's Sugar Bowl. Photo by Pere Ubu. You have to admire a runner’s determination, but when paired with the hubris of a great athlete like Wilson the results are tragicomedy. In order to recover from the slip, Wilson was forced to retreat from the pursuit to the 20. At this point, the defense hit and wrapped Wilson, forcing him backwards another 10 yards where he was dropped at the 30. One bad decision (stretching a play to the sideline) can create another (reversing field) that compounds the negative possibilities (slipping, retreating another 10 yards, and then getting pushed backwards another 12 yards). Even some of Wilson’s gains were demonstrations of immaturity. Wilson’s first carry of the second half was a two-yard gain on a 2nd and 5 run with 14:30 in the third quarter from a 12-personnel set. The unbalanced line with receivers 1×1 faced a 4-3 and Wilson took the exchange towards LG and LT collapsing the inside of the line from the strong side as the wing back sealed the outside and the TE on the line took on the SLB in the flat. Wilson rocketed to the line of scrimmage towards the wing back’s seal. 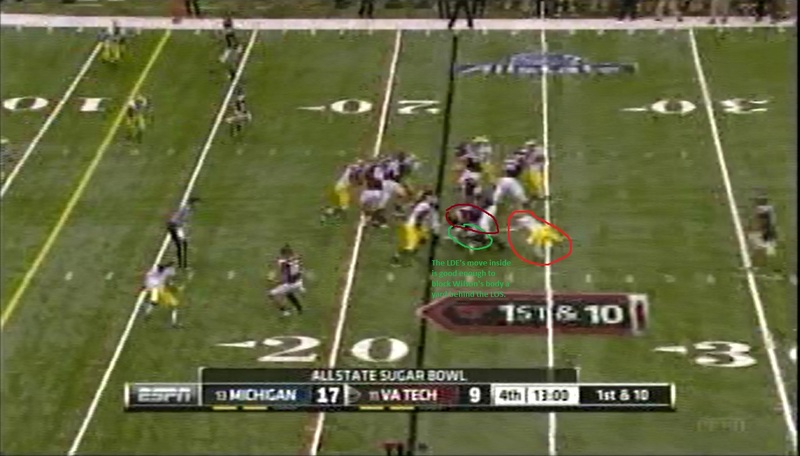 However, the RB took the hole so hard that he collided with the wing back and only managed a two-yard gain. If Wilson showed the patience to allow the crease to develop he likely slides through the hole untouched. A young runner like Wilson wants to sprint to the hole and get the yards he sees. A veteran runner wants to go slow to the hole and get the yards he can’t see. One of Wilson’s two-yard gains was a product of not making a great read of the defense presnap. The play was a power from a 10-personnel, 2×1 receiver set on 1st and 10 with 13:08 in fourth quarter. Wilson was supposed to run power behind the LG pulling to RG. Wilson in a 10-personnel, 2x1 receiver set just prior to the snap. Note the location of the FS, the LDE and LG. 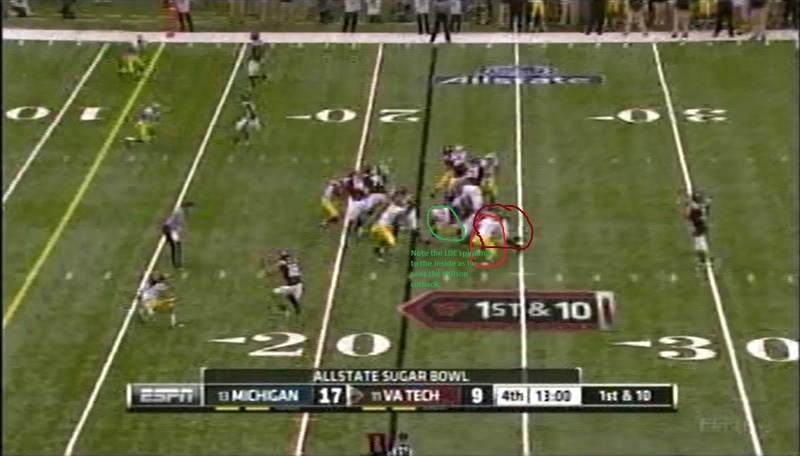 Each player's post-snap movments are diagrammed. What changed the play from Wilson’s perspective was spotting the LDE working across the face of the LT. Note just as the ball is snapped - and actually before - the FS is creeping up and Wilson does not make a mental note of it. The LDE also begins his cross of the face of the LT as he sees the pulling LG. Although Wilson had a nice lane set up at RG, he immediately stopped and tried to cut to the backside of the LT when he saw the LDE getting that penetration across the face. At first, it seems Wilson was probably right to make this cutback because the penetration likely forces the RB to break a tackle at or behind the line of scrimmage before he can reach the hole opening on play side. However, Wilson was probably better off staying play side. The problem is he didn’t see the reason why. Wilson sees the LDE crossing the face of the LT and the wheels must be spinning that he could cut back, provided there wasn't some kind of backside blitz happening. 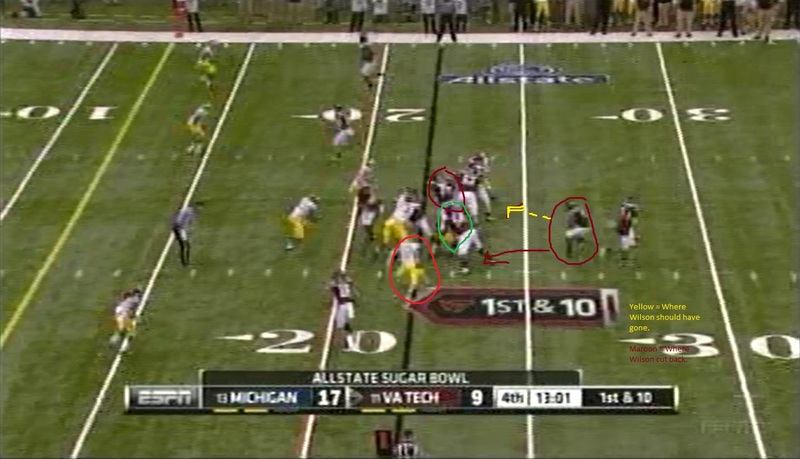 That reason was the FS blitzing to the backside, a blitz he tipped off just before the snap. If Wilson reads this correctly, he understands that there is no cutback lane and he has to break that play side penetration. What’s likely is that Wilson avoids that penetration and hits the power for a gain of 4-8 yards or he breaks the tackle from the penetrating defender for a yard or two. Wilson still has two options, but the cutback is too appealing for a player with great quickness and speed who didn't account for the free safety. Once Wilson makes the cutback, Wilson has a quandary. 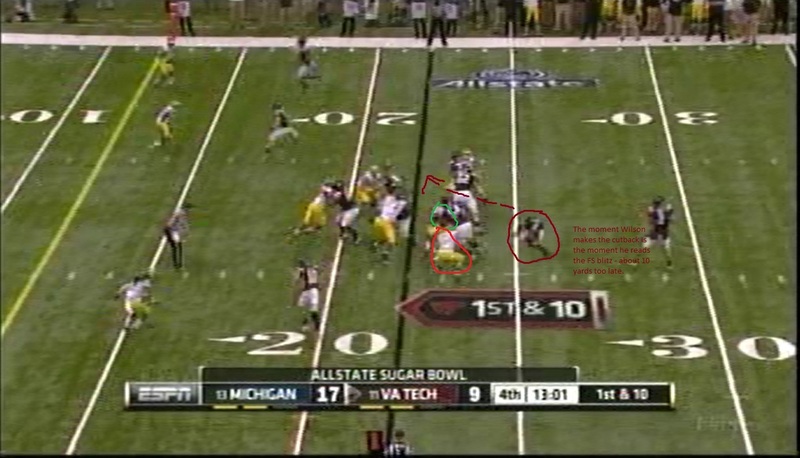 Instead, Wilson’s desire to make the big cut back ends with the LDE spotting the cutback and spinning outside the LT. This spin puts the LDE’s back directly ahead of the slim cutback lane Wilson makes outside the LT and just inside the blitzing FS. Great spin by the LDE to block the already narrowed cutback lane thanks to the blitzing FS Wilson didn't see. The result is a collision at the line of scrimmage with a 300-pound lineman. Wilson shows the strength to plow through the hit to fall forward two yards, but his poor blitz read put him into a worse situation. Wilson's excellent balance to stick a hand into the ground and drive forward three yards after contact for a net gain of two is an excellent display of indiivdual skill, but abandoning the play side block was not. Tomorrow: Part III – Flashes of Refined Play: Evidence that David Wilson has the skills to make the transition to the role of an NFL starter. The plays I will show are situations where he flashes moments of maturity that he should develop with greater consistency within his first 10-18 regular season games on the field. For more analysis like this at every skill position, purchase the Rookie Scouting Portfolio. Pre-order the 2012 RSP and buy past RSPs (2006-2011) here. This is great stuff, Matt. Please keep doing more of these!